When it comes to cases for your spanking new iPhone 5, it is safe to say that you are spoilt for choice. Absolutely. After all, there are way too many iPhone case manufacturers out there, and the sheer number of case models that roll off their production lines are more than one can care to count. However, once in a while, an iPhone 5 case design would clearly make heads turn, as with what id America did with their latest beauty of an iPhone 5 case that they have called the Gasket V8. Anyone worth their salt if they want to be deemed as a motorhead would definitely know what a gasket is, and if you happen to have a great love for all things Apple as well as vehicles, especially when it comes to cars, then you know for sure that the Gasket V8 is a celebration of excellence, and not one of mediocrity. 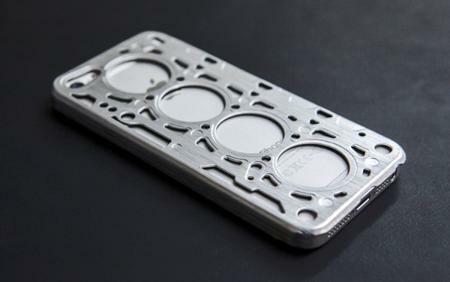 id America’s Gasket V8, as its name implies, was Inspired by the shape of a head gasket on a performance V8 engine, where it was made using aircraft aluminum and has been specially molded to provide a form fitting structure for your precious iPhone 5. Aircraft aluminum, now that kind of material seems to be getting more and more popular these days, and I suppose that is with good reason, too. You cannot quite pick up the Gasket V8 case at the moment just yet though, as it will be made available only on this coming March 20th. The Gasket V8 is said to offer optimal comfort and style for the iPhone 5, where it boasts of an interlaced design coupled with smooth, rounded edges that offer additional grip so that it is a whole lot easier to tote around. With its slim, sleek design, you will not have any issues accessing any of the ports, buttons and switches. You can choose from Titanium Gray, Vintage Gold, Aluminum Silver, Rally Blue, Brilliant Red, and Forest Green colors, at $29.95 a pop.